Russian presidential envoy to Afghanistan and head of the Second Department of Asian Affairs under the Russian Interior Ministry, Zamir Kabulov, talks about prospects for a settlement in Afghanistan. On April 26, an international conference on regulating the situation in Afghanistan commenced in Kazakhstan. On the eve of the gathering, Russian presidential envoy to Afghanistan and head of the Second Department of Asian Affairs under the Russian Interior Ministry, Zamir Kabulov, spoke to Kommersant's Elena Chernenko about what he thinks will happen to the country after the large-scale drawdown of NATO troops in 2014. Kommersant: NATO recently announced that the Afghan army and police are maintaining order in the territories that are home to 87 percent of the population. Is that figure realistic? Zamir Kabulov: First, I am not convinced that it corresponds to reality. And, second, the key words here are "control" and "maintain order." Question: How are they doing it? Today, only 7 percent of army and 9 percent of police units in the country, according to U.S. estimates, are adequately trained to operate independently with minimal support from the International Security Assistance Force (ISAF). Every month, three out of 10 recruits in the Afghan National Army (ANA) go AWOL or are killed, wounded, or taken prisoner. The number of deserters in the last three years exceeds 63,000. That's a third of the army! Kommersant: Where did NATO go wrong? Z.K. : In my view, NATO's leaders are forcing the handover [of power and land] to the Afghan security forces without taking into account the real situation. Kommersant: What are the possible scenarios for Afghanistan after 2014? Z.K. : First — the elections pass off successfully, Hamid Karzai's successor pursues the same course with foreign financial and military assistance. Second — the election results look dubious to most people, which leads to a political crisis and mass inter-ethnic clashes that portend civil war. Third — the Taliban blocks the elections, seizes control of large swathes of the country and stamps its authority. Fourth — an agreement is struck with the Taliban and they are delegated some powers. The third and fourth scenarios could also provoke a civil war. Kommersant: Which scenario is the most probable? Z.K. : If the task of improving the combat capability of the Afghan national security forces is not solved — and the present situation does not breed optimism — the influence of extremists is likely to rise, which is fraught with all kinds of potential traumas, all the way up to civil war and the division of the country along ethnic lines. Kommersant: Can the Soviet experience in Afghanistan be of use to NATO? Z.K. : We have spoken about the lessons to be drawn from the Soviet experience for many years. But NATO is not really dealing with the economy or construction. Therein lies the crucial difference. Najibullahwas able to hold out until 1992 — i.e., three years after Soviet troops withdrew from Afghanistan. Two of them were stable, during which time the Mujahedeen was powerless. The collapse began when we stopped supplying fuel and ammunition. Kommersant: It's not too late for NATO to take that on board. Z.K. : Not everything is decided by fuel, weapons, or training. Sometimes troop morale is of paramount importance. And that is in very short supply in the Afghan army. They’re not even sure that they're defending the interests of their country. Kommersant: Is the increasing number of "green-on-blue" attacks proof of that? Z.K. : There are many reasons for that: public fatigue from more than a decade of coalition forces on the ground; disappointment with the campaign; the lack of an effective government; the disregard for the historical and cultural traditions of Afghan society. 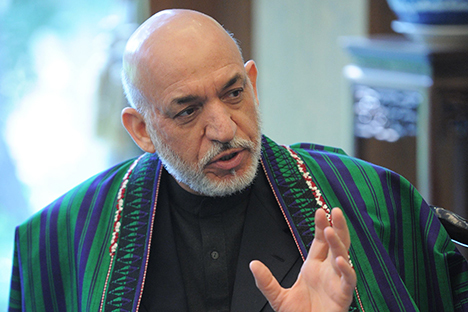 Kommersant: What is Moscow's attitude toward Karzai's plans to establish a dialogue with the Taliban? Z.K. : Moscow does not oppose such a move, but only under the leadership of Kabul and the strict observance of three conditions: The Taliban should lay down its weapons, recognize the Afghan constitution and sever all ties with al-Qaeda and other terrorist organizations. Kommersant: An agreement was reached to open a Taliban office in Qatar. Is that advisable, in Russia's view? Z.K. : It's a necessary step aimed at demonstrating the success of the West's Afghan policy and creating the conditions for talks on security during the withdrawal of troops. But the practical impact cannot be discussed yet. We support the process of national conciliation, but it must be led and carried through by the Afghans themselves. It should not be the case that the Taliban talks first to the Americans, the British, or anybody else, and only then reports to the Karzai government. That is not national reconciliation.